This Minecraft Guide is part of a series that I'm writing on Minecraft! To get to the other Guides, click on my avatar! It'll bring you to my About Me page, which includes the links to my other Guides. Thanks to DtPv2 for the awesome banner! How do I build an awesome base in Minecraft? That's a question oft-asked here on the Minecraft Forums. There's many, many threads with people asking what they should put into their base, to make it more awesome. So here's a comprehensive list of things to remember when building your base, and what things you should have in your base. I realize there are other threads like this, chiefly the one started by user A Blind Moron, but this one is even longer and more detailed than most of the others. Please note that all of the projects to make in your world that are detailed in here are useful for Minecraft purposes. In this thread, I won't give you ideas for building castles, or lighthouses, or mansions, etc. All of the ideas in here automate your Minecraft experience, and all of the projects have an actual use in your world that automates your Minecraft life even more. Do you watch youtube channels like Etho and Docm77, where they have completely automated worlds and every cool invention possible? Possibly want an even better world than them? This list is for you, too! Many of the ideas brought up in this thread will give you ideas for cool things you could make in your world! So, let's begin! Open the spoilers to find out whatever you want to learn about. Caution for people with slow computers, opening all the spoilers will give you a block of text 15 pages long. Don't worry, though, pictures are wrapped inside individual spoilers. One can easily make a seed farm by having a patch of grass in your base that's above your head. Bonemeal it from below, and then use a piston-controlled stream of water to bring the seeds down onto your head! Bread is a good food source for everyday Minecrafting. It revives your hunger bar 2 and a half bars, and is stackable for easy carrying. Wheat is stackable too, so you can have a few stacks of wheat and a crafting table in your inventory, and be set on food for quite a while. Open the spoiler for an example of a wheat farm. Melons are a good food source in the game. Although they only heal one hunger bar, they are easily farmable and plentiful once you have melon seeds. Of course, though, finding the actual seeds is harder than a lot of other sources of food. Open the spoiler for an example of a melon farm! While Pumpkins aren't a food source, and aren't useful for too many things, they are good for making into Jack-O Lanterns as a cheap substitute for Glowstone, or put them on your head to avoid Endermen! Here, have a picture of a pumpkin farm, wrapped inside a spoiler. Mushrooms! Yay! Mushrooms are incredibly useful in Minecraft. Bonemeal a mushroom to turn it into a Giant Mushroom, perfect for making a cute little house out of. Or, bonemeal mushrooms, and then break the mushroom blocks to harvest regular mushrooms! Make some bowls out of wood in your crafting bench, and then craft mushroom stew on the fly (it doesn't require a crafting bench). Open the spoiler for a photo of a giant mushroom! Sugarcane is a lot more useful than it's made out to be. 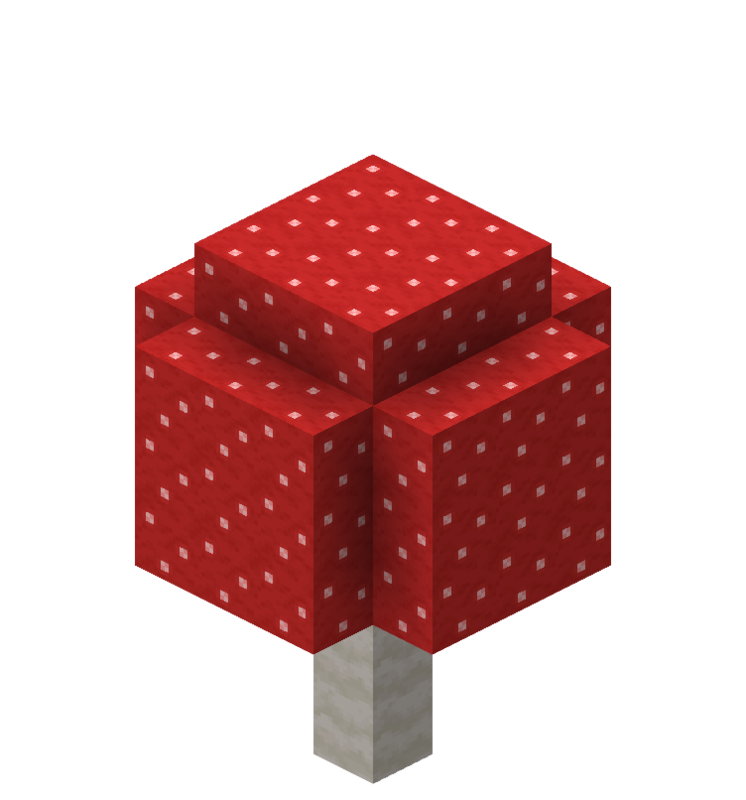 It can be crafted down to sugar, which is useful in potions and for making cake. Also, with raw sugarcane, you can make paper, then books, and then even bookshelves, which are useful as decoration and enchanting! 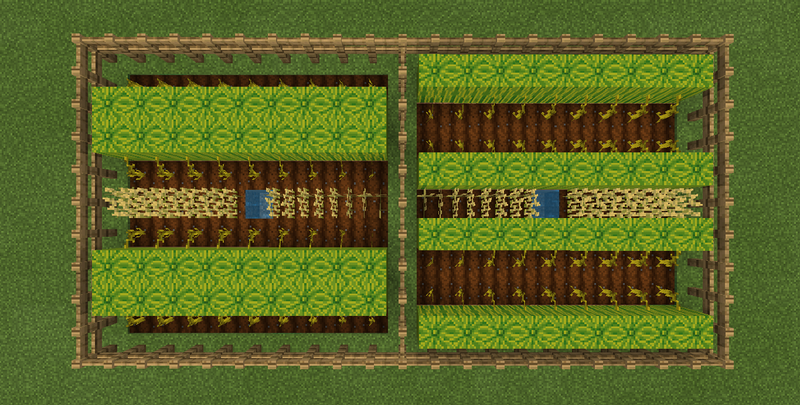 So, make a sugarcane farm today. 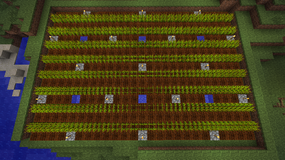 I don't really think you need a picture for this-- just put sugarcane around water, and set up a piston harvesting system. Ah, the tree farm. A staple of Minecraft life, tree farms supply you with the essential Minecraft material, wood. Whether you want a simple tree farm, or to get fancy with exactly spaced trees that can be cut down with an Efficiency axe while sprinting, a tree farm is a must so that you don't have to go and tear down your neighboring forests every time you want some wood. No picture for this one either, because designs vary quite a bit. If you want to use potions, a good source of Netherwart is a must. Since Netherwart will only grow in the Nether, this needs to be made in the Nether. Use an automatic Netherwart farm, or just create a manual (but very cool-looking) farm, using end stone and vines on the walls. Your friends will wonder how you designed a farm so well! Open the spoiler for a picture of a Netherwart farm. Same as the seed farm, using the same principle. You'll get flowers from that farm, too. Ah, man, cobble is common, right? You get far too much of it from mining. But make a cobble generator anyway! It's useful for building large projects involving smooth stone. Just collect tons of cobble, and smelt it in your furnace room using blaze rods from your blaze farm. (More on this later). No pic for this one, because cobble farms are fairly easy to make. Do you want an automated Minecraft world, where everything is convenient and easy to do? Look no further than a retractible workbench! If your base is underground, you might want to consider having these around your base. Using a piston and some redstone, make a workbench spring out of a wall when you press a button. Look it up on YouTube if you want to know how to do the wiring. Sorry, no picture. You need a railway to get around, right? So make one! (Or two, or five, or a million!) For a totally automated world, you should have a railway going to your stronghold and all your experience farms! You should also have railways in the Nether, going every place you could possibly think of! Enchanting rooms are a must for enchanting your diamond tools with Level 50 enchants. Put a row of bookshelves 2 blocks high around your enchanting table, all one block away from it. Put the enchanting table in the middle of it. Optionally, put a glowstone block under the enchantment table to spread light in the room, because light passes through enchanting tables. Be sure not to put any paintings, torches, etc. between the table and the bookshelves, because that will stop you from getting high level enchantments (because it deactivates some of the bookshelves). If you like, put an awesome texture pack on that will make the room look even better! Click on the spoiler to see one example. Every good base needs a storage room! Go wild with this room. You should decorate it and make it look as cool as possible. Look at the "Block Combinations" section of this thread to get some ideas for building a storage room. If you really want to get fancy, make an auto minecart system that carts certain types of supplies to you at the press of a button (or the flip of a lever). Yawnn... you're sleepy, aren't you? All of that hard work in the mines is really getting to you. So build yourself a nice bedroom! You could make a canopy bed using half slabs beside the bed and a roof over, or make a bunk bed using the "floating bed" trick. Or, if you reside in an above-ground home, make a bedroom looking out onto a Minecraft ocean! Open the spoiler for a picture of a nice bedroom. Do you have nice wolf pets? Make them their own room! Using different colored wools, make little beds for them carved in the wool. Then give them nameplates using signs. Decorate the room, and you're done! Now your canine friends have a little sanctuary, just for them. Have a boring wall in your base? No ideas on how to decorate it? Make some pixel art on the wall! One example is in the spoiler. The truth of the matter is that most people need a lot of TNT for Minecraft projects. If you are a Minecraft pro, TNT is really useful for hollowing out large areas underground for making temples, or whatever. But for TNT, you're going to need a lot of gunpowder! Creeper farms are relatively easy to make-- make a regular mob trap, and have the collection tube be in the sun. Use glass for the collection tube, and regular mobs will burn in the sunlight, leaving only creepers behind. K.O. them for gunpowder. It's a bit hard to explain, but check out some of Etho's early videos to see his mob trap. You can make a spider farm, using a spider dungeon, for plenty of string and spider eyes. If you're looking for a Cave Spider farm design, see the Cave Spider section, a few paragraphs onwards. See the Skeleton Farm section. Look up a design on YouTube for this. Not too hard to find one. Look up design on YouTube. Look up design on YouTube. I recommend docm77's Iron Lung design. An Enderman farm in the End, using either Etho or Docm77's design. I know I reference both of them a lot, but they have worlds that many people want their worlds modelled after, because of all their automated designs for farms and traps. Designs on YouTube are plentiful for cave spiders. Xisumavoid's tutorial on these is fairly clear and easy to follow. (I'm not related to his channel in any way, shape, or form; I just like his tutorials. Same with any of the other YouTubers listed in this thread). Use Etho's design. Find it on YouTube. This design has been imitated by many other YouTubers. This is pretty hard to make, but it's possible. Look on YouTube for a design. This won't be a fully automatic farm. Look on YouTube for these designs. Using pistons to push the blocks needed into place, you can make a snow golem generator. Look for designs on YouTube for this. Have more arrows from your skeleton trap than you know what to do with? Build a shooting range to test your skills and accuracy in Minecraft shooting! Bonus points if you have a scoreboard that's automatically operated by redstone when you shoot the target. Open the spoiler for one example. Do you want Minecraft to have a goal? Try and make a block museum! Create a room in your base, with a slot for every legit obtainable block in the game. If books ever become writable in, chronicle your adventures to find each block in a book next to the block. Or, you can post your story on signs in a secret piston-opened room behind the block museum. Of course, this is a given. Every base needs a mine. But what if you're bored of the same old stone caves? Take some glowstone, some soul sand, some leaf blocks, some netherrack, and any other interesting blocks and decorate the caves around your house! You'll actually enjoy walking through the caves near your base to get to that new unexplored area, and people will gasp when they see the cool caves. Now, with the newest Minecraft update, you can get all of the records by getting a skeleton to kill a creeper. There's plenty of designs on YouTube for a record farm, so just look it up. Then, after you get all of the records, make a record room in your base with tons of jukeboxes and chests with all the records! Come into the room whenever you're feeling a bit musical, and play your favorite tune in Minecraft. (My personal favorite is cat). Look at my description of the record farm for more information about this. Every base needs a little pool where you can farm squid and catch fish! Fish are a nice-healthy food source, high in Omega- 3's (in real life!) Make a little pool in your base, and decorate the pool room with some tall grass, vines, and sugar cane to give it that tropical feel! This is fairly simple. Just have a wall of furnaces, making charcoal, outside of your tree farm. This will generate plenty of charcoal, which is good incase your coal supply is running out. Did you know that you can also use blaze rods to cook things in furnaces, besides charcoal? Blaze rods are really more efficient than charcoal, once you get a blaze farm up and running. Build a cool room for your Nether portal! You probably go in and out of it very often, so why not make the entrance look pretty dang cool? For one example of a really cool portal room, click right Also, you should have an off/on switch for your portal. It is possible to turn a portal off and on using a button. 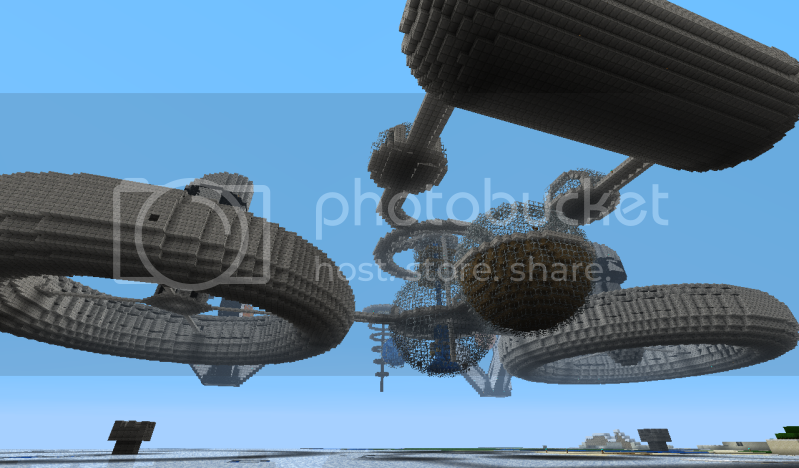 If you don't believe me, look at docm77's world, where he has one. Build a mysterious library, using redstone torches and vines to give it a mysterious feel! For optional awesomeness, you could put your enchanting room in the library, too! 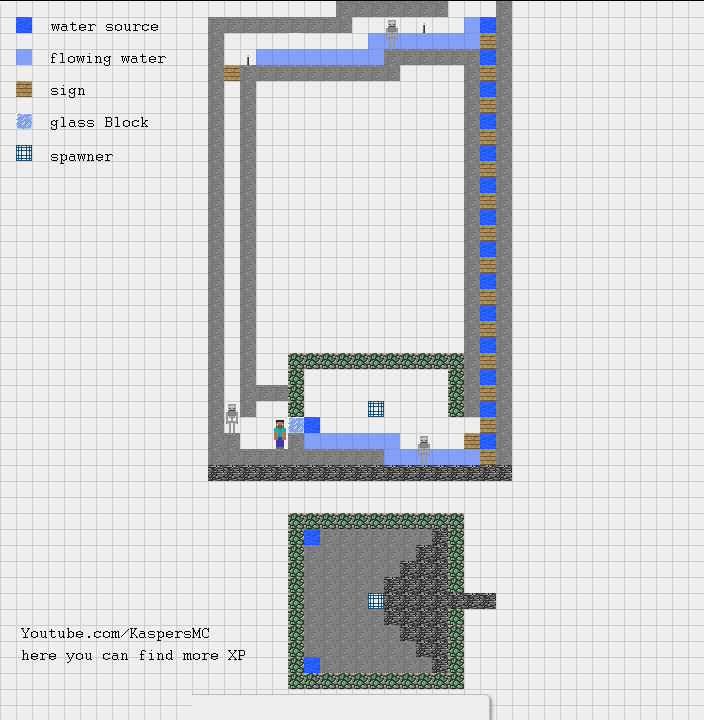 If you live underground in Minecraft, it might be useful to know if it's raining or not. It's possible to make this; look to see how to make it. These will hopefully be categorized later, when I have more time. A good base has lots of cool devices and inventions, but how do you make your base look nice? YouTubers like Etho and Docm make it so easy to make elegent, good-looking bases. Well, now you'll know how also. The secret is Block Combinations. That is, what blocks go together nicely. In this section, I'll be telling you what block combinations look nice, and also I'll be giving you a couple ideas for designs for your base! -Stone Bricks, Nether Brick, and Glowstone look nice together. -Melon blocks and Pumpkins look nice together. -Mossy cobblestone, Bricks, and Bookshelves look nice together. -If your base looks a bit plain, put a fence with two vertical leaf blocks on top! Looks like a little tree, and is a good decoration for a boring room. -Try putting trapdoors on all your glowstone! It makes your glowstone look nice, and it also makes it look like tasty waffles. Mmm! (Please don't sue me if you get hungry while playing Minecraft). -Don't forget paintings! If you have a boring wall, put a painting on it! Try making a secret door using paintings! -Try making an awesome bedroom, with half-slabs around the bed and a roof over, to make a canopy bed! -If you have a Silk Touch pickaxe, mine some ore blocks and make a wall out of them! Try building a room out of diamond ore, or make a pattern of the different ores on the wall. -Have stations around your base where you can "fuel up". Have splash potions in dispensers that fire at you, making you run faster and jump higher (you get a cookie if you get the reference). -Just be imaginative! Make your base different than everone else's! Try building your base in the sky, or on a boat, or in the End. Just have fun with it. The location of your base will also influence how complex it is. For example, if your base is underground, you might have the space to hollow out a massive area, and to make a huge automated reed farm. If you're living, i.e. ; on a boat, you might only have space for a tiny, manually-harvested sugar cane farm, or even none at all! Next, I will go over some of the Pros and Cons of building a base in some various locations. -Cons: Never see the light of day. 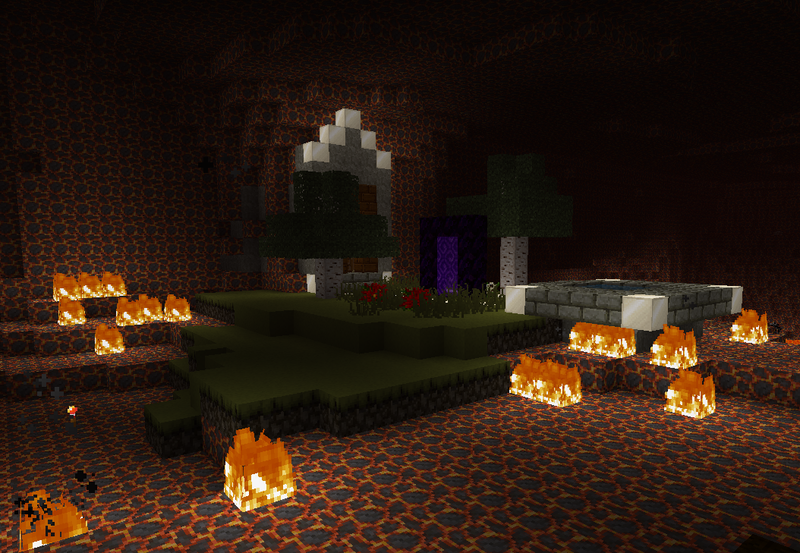 -Cons: Barren, lonely, no grass without silk touch, danger from Endermen and Enderdragon before dragon is killed. -Cons: Not much room to expand your base, lonely (unless you bring some cows, pigs, chickens, etc. with you on the boat). Open the spoiler for pictures of each type of base! Hopefully these will give you some building ideas. Of course, most of that information about location is just common sense. Still, it helps some people to see it written down so they can weigh the pros of a location against the cons. I don't want to inject too much opinion into this thread. I mostly want this thread to have facts. But my personal favorite location to build a base is underground. There's nearly infinite room to expand, carving out new rooms is easy, you can build Minecart rails to get around, night/day cycle doesn't affect you, and it's just really cool to have an underground base anyway! Did you read the entire post up until this point? Want some closing tips; things that you should remember while making your base? Well, here are some! First of all, try not to imitate the major YouTubers' bases. Sure, many of them, like Docm77 and Etho have really awesome bases, and many people aspire to be just like them in Minecraft. But although imitation is a form of flattery, in the long run, it's going to be more fun for you if you are creative and make up your own ideas. If you build a base that looks a lot like Etho's, you may have fun copying his cool designs now, but later on you'll look back and say, "I wish I had built something of my own creation!" If you just try your own thing from the beginning rather than trying to copy someone else, your base might even turn out better than theirs! Also, another tip, although it sounds corny, is to never give up. Desigining a home can be very, very frustrating. Working with redstone can be even more so. If one of your creations doesn't work, or is blown up by a creeper, and you feel yourself about to all-out rage, throwing your keyboard across the room at your basket of X-Box shaped donuts on top of your cat (wat?) then take a break from Minecraft! Give yourself some time to calm down, and then come back to building whatever you were building when you're calmer. If you keep building in your enraged state, without taking a break, you'll probably just mess up more stuff, and rage even more. Don't be afraid to come to the forums for help on your base! If you post a topic asking for help designing something or thinking up ideas, sure, there will be plenty of people that say things like "You must be new here" and call you a noob. But there are a good number of polite people on the forums that will help you out. Just ignore the mean people. And, if you see a thread like this, spread the love and help that person out. Don't be rude to other people! What goes around, comes around. Although this isn't really a tip (it's just common sense), you need to love what you're doing. You can't build an epic base unless you're in the mood and you want to. I find, personally, that some days, I'm more keen on playing Minecraft than others. Wait to play Minecraft until a day you really want to, and build something then. I guarantee, it will be really awesome. 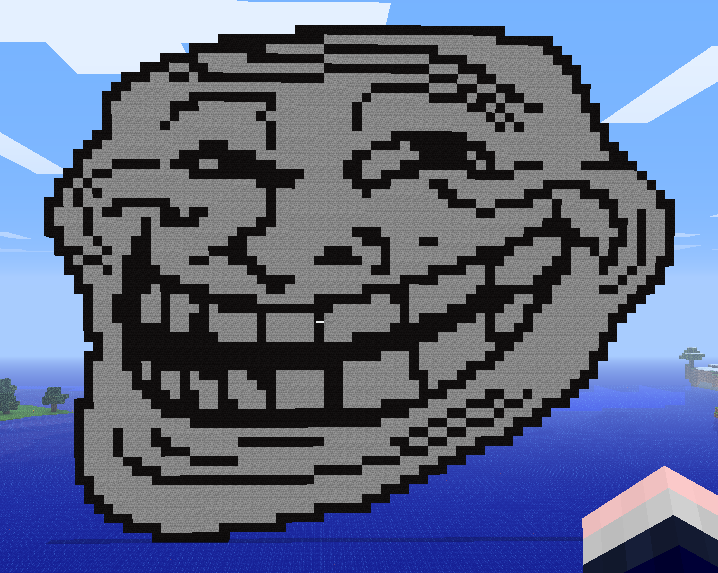 Also, if you start a project in Minecraft and find you just don't love building it anymore, take a break from it! Chances are, you'll come back to the project later with renewed vigor, after you've thought up some good ideas about what to build. Over all, have fun with it! Minecraft is a game, and is therefore supposed to be fun. Stop doing something if you aren't having fun with it, and don't start something if it seems like a chore and not play. Don't create a complex base with lots of redstone unless you actually like making redstone circuitry. But feel free to try new things! New things often lead to fun new experiences. Anyway, you're awesome if you read through all these tips. I doubt anyone will, because my writing style isn't particularly entertaining, but I hope you gleaned at least a bit of knowledge from this thread. I appreciate your reading it! -the Minecraft Wiki may be found here! -Etho (a YouTuber I referenced a lot in this thread) may be found here! -Docm77 (a YouTuber I referenced a lot in this thread) may be found here! So, that's everything for now! Please post any more ideas for bases you have to add to the list down below, and I'll try to add them (no guarantees, though). This topic will be constantly growing and expanding, and over time I'll be adding more things to the list. I really like this. Thank you for contributing to this forum in a great way. +1 for you!! Sure! I like to contribute in any way I can. Hopefully, this thread can become a hub for building in Minecraft. I will be adding to it over time, and people can submit ideas to me to be included in it. so you copied a topic that blind melon made a few days ago and now want rep with it? Err... his name is Blind Moron. And no, I didn't copy him. That was from an earlier edit when I thought this topic was going to be about generally building things in Minecraft, rather than building bases. He had made a similar topic, so I wanted to credit him. But I never copied him originally, and certainly not now after writing this. He just had a similar idea, so I made this topic to expand on that. Then again, because of your avatar and the fact that your user rating is 1 star out of 5 on your profile, I don't take you very seriously. I mean that in the nicest way possible. Nice post with lots of good information! And I threw it on the ground! Where's my cookie? I don't always die with full diamond armor, but when I do, it's because I fell off a cliff. omg, best response ever. You got called out and your defense is to rip on me. Nice. I'll say this in the politest way possible, because I do not wish to start a flame war on my thread. I did not copy any of the actual text from The Blind Moron's similar topic to mine. But I just wanted to credit him, because I got the idea for this thread from him. I'm sorry about the misunderstanding, and for ripping on you, if you perceive it that way. I don't want anyone to get angry at me for posting the thread, and I didn't post it for the rep. I was just hoping that someone will get something out of this topic. Thank you for your replies, though. I'm glad to get any sort of feedback on my post, whether it's positive or not. I hope you feel I've solved this argument in a fair and just way. However, if you don't, you can always PM me and we can talk further. 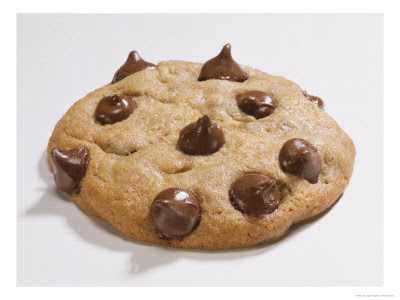 You sir get my first ever +1, and a cookie if I had one around here. My only complaint really was I had expected to see some kind of how-to building type tutorial guide with your subject. Not a list of building ideas similar to the other thread. As for my avatar, its an inside joke from many many years ago and I laugh when I see it. She's been elven thin on some websites and 300lbs and short on others :/ But people I've met elsewhere instantly identify me by it these days. I'm really curious about the seed farm. I'm not sure what you mean by it. Oh, well, it's not very useful, because once you've started a wheat farm you have seeds anyway, but there is a roof of grass blocks with a one high space above them. Then you stand below the grass. Bonemealing a grass block to make tall grass works from below, too. So you click on the ceiling with bonemeal. Then, tall grass and flowers grow on the grass. Then, using a piston to control some water, the drops get washed down to you. That's a good idea, but I already have that on the list! EDIT: Oh noes! No no no no no! Part of the list apparently got deleted when I posted the thread! OK, at least I had a backup of the thread. Restoring the backup now, be back in a moment. Silly me and my clumsiness on the forums. Thanks for the idea though, Wiredattendant95! Also, lucky you that you get to play Minecraft with your sister! My sister isn't too keen on Minecraft, LOL. Hee-hee! I'm such a troll.